Om Nom Nom. I tried lots of tasty treats on my trip to the capital, luckily I also did tonnes of walking so I've managed not to put on two stone in the process. So on to the macarons. I visited four different places and as a 'control' I always chose chocolate as the first flavour and caramel as the second. And I mostly chose the small macarons where I could. 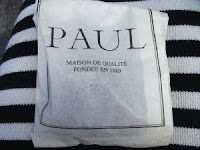 I went to Laduree, Pierre Herme, Maison du Chocolat and PAUL. I found the staff at Laudree quite rude. Maybe they treat you better if you buy more? 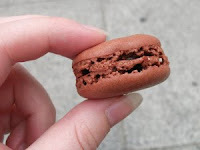 I found their macarons to be the most delicate and had a beautiful shape. They have a thicker filling and the texture was slightly lumpy. 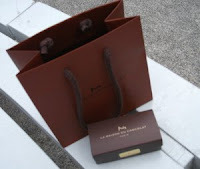 Laduree paper bag from Burlington Arcade. Very uniform and smooth looking. 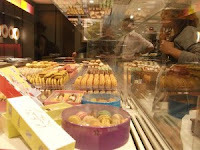 The staff were helpful at Pierre Herme and talked with me about the different flavours. The macarons where slightly thicker than Laudree and very smooth. They were less cakey and the salted caramel was delicious. They had a stronger flavour. Packaging from Pierre Herme in Selfridges. Chocolate macaron with cocoa dusting. 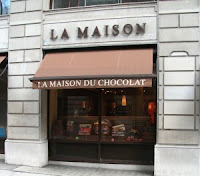 The staff here were very nice, the shop is elegant, well spaced out and air conditioned to keep everything cool. They like to package things up so they are a real treat. 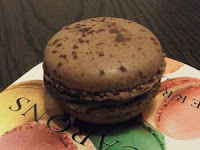 The macarons were delicate and had a very smooth filling. 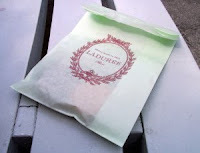 They are slightly smaller than the Laduree offering, but it's more of an experience buying them. I went to the one at Covent Garden - the people are generally nice though the cafe is quite upmarket. Everything is more expensive if you eat in. 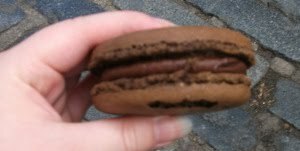 I had the large chocolate macaron, not entirley fair since it was a bigger size, but it tasted like the most divine brownie in the world. Very fudgey, but still light. 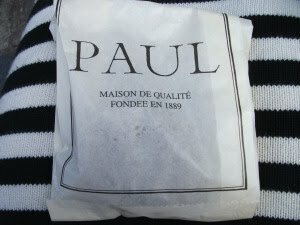 My personal favourite was the PAUL macaron. It wasn't quite as delicate some of the others but it tasted great. Laduree and Pierre Herme had some very pretty packaging if you were buying larger quantities but I prefered Maison du Chocolat as a shopping experience. I might have another go at baking my own now I know how they are supposed to taste. Oh gosh, this made me hungry. There are only two places around where I live that sell macarons and of the two I've only tried one, since they're both still relatively far to get to. The big fudgy one looks amazing!! 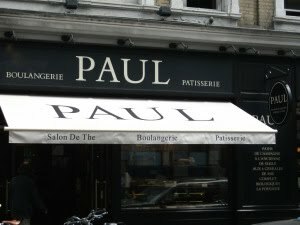 I love Paul!! I first discovered one of their shops in France. Unfortunately none near me here in UK or i would be a lot more macaron filled more often! Yeah, I wish any of these places were nearer to home. I can't afford to travel to London very often - hence I had to try them all on one day!! Yummm the big chocolate one made me drool a little, not going to lie! I'd like to visit Laduree in Paris and see if the service is any better.